No more burnt fingers for you! This is a must have tool for changing print nozzles. Having the right tools makes all the difference in the world! Step 1:Turn on 3D Printer, set nozzle temperature to target (PLA: 180-220, ABS: 240-280). Step 2:After heat done, use SPANNER to hold heat block, use Socket screwdriver to screw old nozzle out. old nozzle will be very hot, don’t touch by hands!!! Notice: NOZZLE and Heat Block on 3D printer need heat before take out, don\’t touch it by hands when printer is heading or close less than 10 mins. No more burnt fingers for you! This is a must have tool for changing print nozzles. Having the right tools makes all the difference in the world! 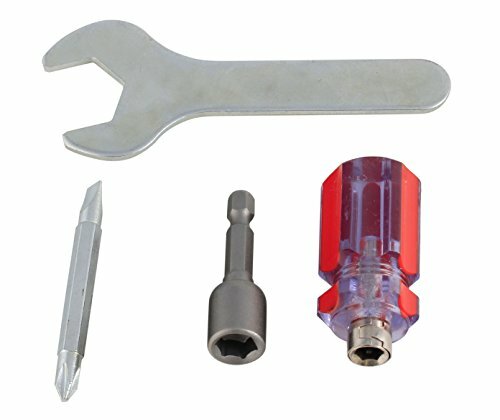 Special tools: special spanner and multi-function screwdriver can help you adjustment 3D Printer and change extruder nozzle more easy! Note: Screwdriver maybe rust, but No effect on use.